This page is where it all began and its unique swiping functionality is what makes this app different to the rest. Swipe horizontally to move between different time periods (Intraday, Daily, Weekly, Monthly and Yearly). Keep swiping left to right to move back through Intraday for previous days. The App will fetch Intraday data and generate graphs only when needed. 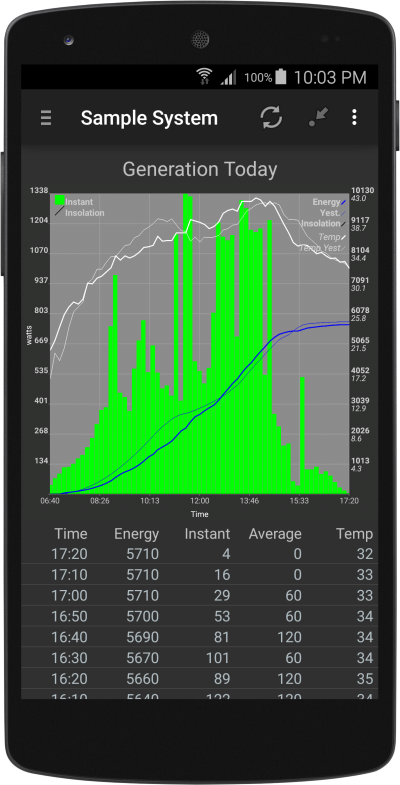 Swipe Vertically to move between different graphs for the same period (Generation, Consumption, Extended Data and Gen v Cons etc). Refresh data using the Action Bar icon. This will trigger an update of Intraday data (for the day your looking at) from PVOutput.org. Using this button should only be necessary if you have Auto Updates disabled (see Preferences). Return to Today by pressing the Action Bar icon. This is useful if you have been busy scrolling through left and right and simply want to return straight back to today's page. Click the Graph to force it to be regenerated. This is sometimes needed... sorry. Click on a Data List item to Drill directly to an Intraday or Daily graph depending on the item. For example, when viewing the Yearly graphs, clicking on a Year will drill you to a Daily graph for the entire year. Long-click on a Data List item to view and choose a Drill option. For example, when viewing the Yearly graphs, you can choose to Daily (all days for the year), Weekly (all weeks for the year) or Monthly (all months for the year). Click the Data List header line to hide the graph to see a full page data list. Click the headers again to bring the graph back. In landscape orientation, the Data List is hidden and you get a full page graph. When you rotate your device, each graph will need to be regenerated for the change in dimentions. Be patient, regenerating graphs is expensive. Hence why I cache them and only regenerate when needed. This will add the current page graph to the bottom of your Dashboard. This will take you to the System Detail page where you can view the location of the System and all about it. This page also shows you the system PVOutput.org Supporter Status and member status for the Android App Team on PVOutput.org. This will take you to the System Edit page. See the feature page for more detail. This will take you to the Add Output page. Here you can post your daily Generation and Consumption up to PVOutput.org directly from the App. Useful for people that don't have their data automatically loading up to PVOutput.org. This will refresh all the data for your system. It's basically the same as deleting your system from the app and adding it again. Useful if you don't use the app very often and end up with gaps in your data or, if you have manally corrected data on PVOutput.org and want it reflected in the app. Yep... no surprises here... it wil delete the system from the app. No warning... it will just do it. Hmmm... very interesting. This is a glimpse into the future. Soon you will be able to build your own Schemes. This option allows you to view the Scheme that determines what the Systems Page shows on the Graphs and the Data List. Every 'System' gets a default Scheme that I define. In future, you will be able to clone and modify or define your own schemes from scratch. So there it is. The biggest and most complicated part of the App. Any problems, please drop me an email.